For a long time this cover was considered the work of Jack Kirby but it was actually created by Joe Simon. 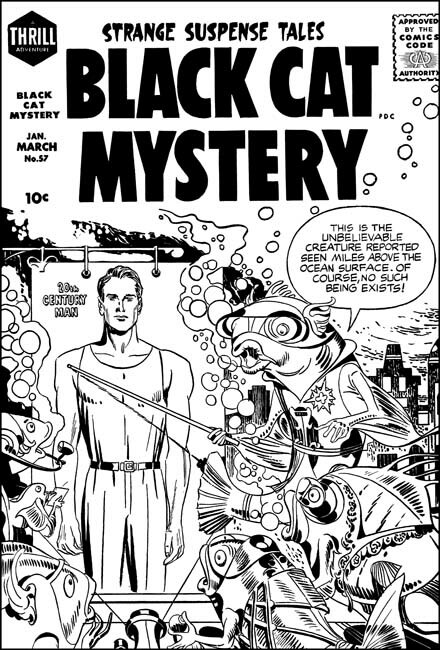 This confusion is understandable because it is a swipe from an unpublished cover that Jack did (for a more complete discussion see Alternate Versions of the Alarming Tales #3 Cover, although I no longer believe Kirby was the inker on the unused cover). 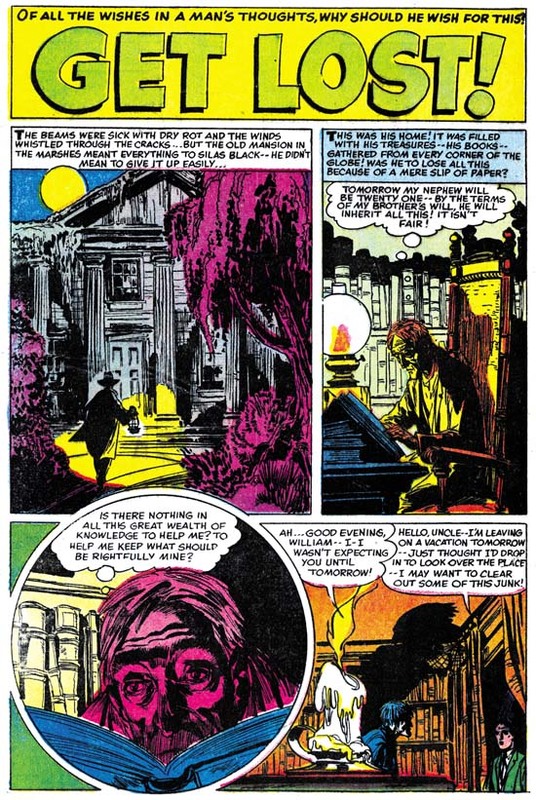 The contents page was used is an house advertisement in Black Cat Mystic #61. The inking of this story has in the past been attributed to Steve Ditko but I think we can confidently reject that claim. 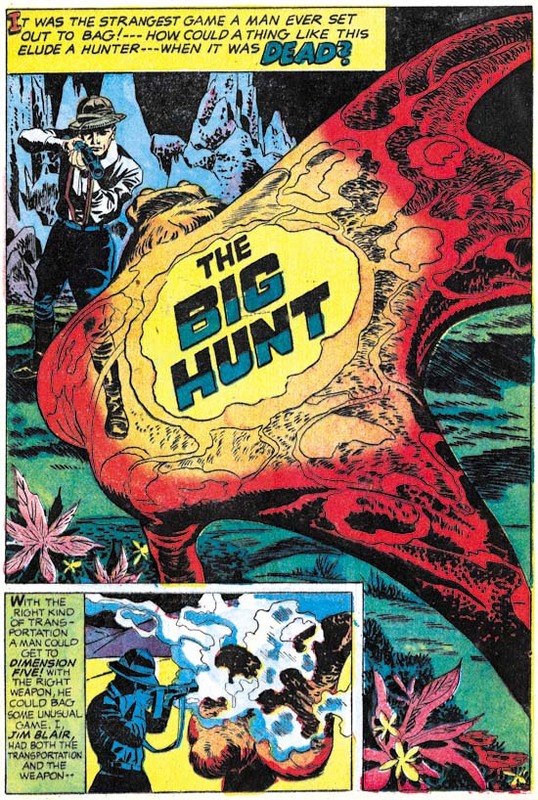 The figure in the lower right corner of the splash does look a little like Ditko’s work, however the blunt brushwork is nothing like Ditko’s inking at the time. 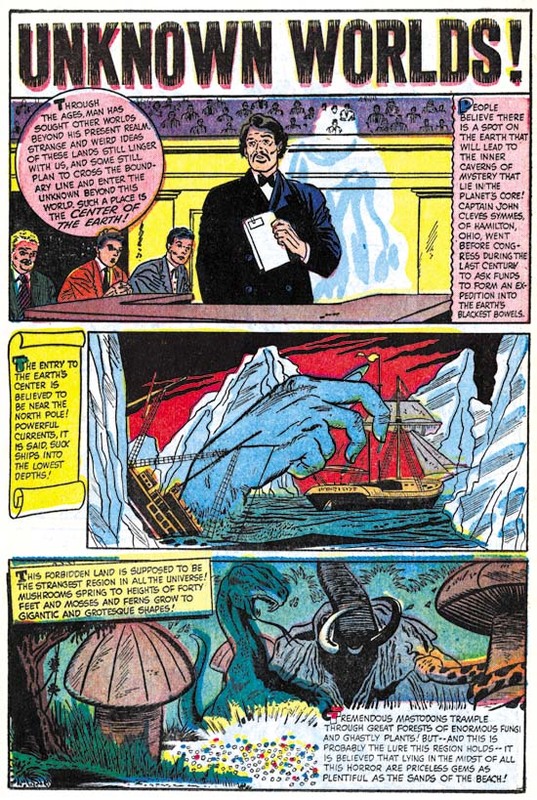 One explanation could be that the inking of the splash was done by Mort Meskin whose work greatly influenced Ditko. Beyond the figure’s appearance, nothing in the brushwork suggests Meskin’s inking. Still I find it hard to believe that Kirby inked the splash either. The rest of the story does look very much like the inking of Kirby himself. 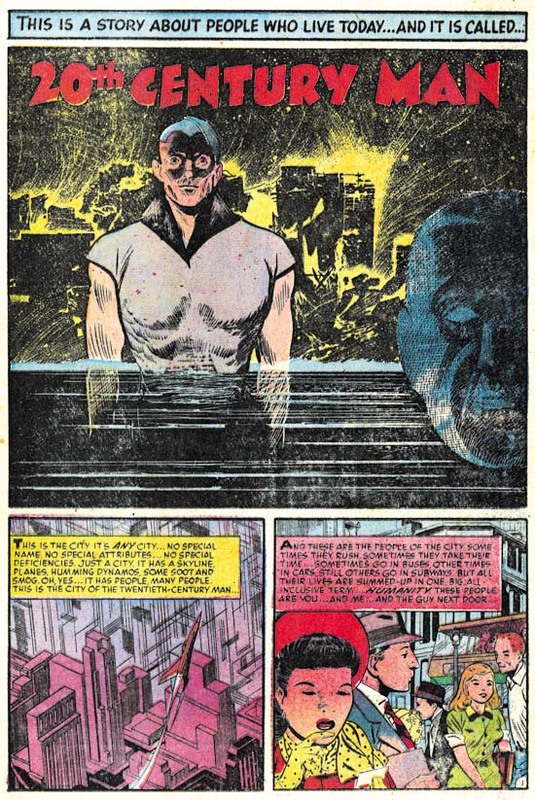 There is a lot of work by Doug Wildey in AT #3 and in fact he would be frequently used in later issues of Alarming Tales and Black Cat Mystic. Wildey was an accomplished artist but unfortunately sometimes worked in greater detail than the crude printing of Harvey comics could handle properly. Alarming Tales #3 (January 1958) “Get Lost”, pencils and inks by Ernest Schroeder? I am really not that familiar with the artists from Harvey at this time and this attribution is from GCD. 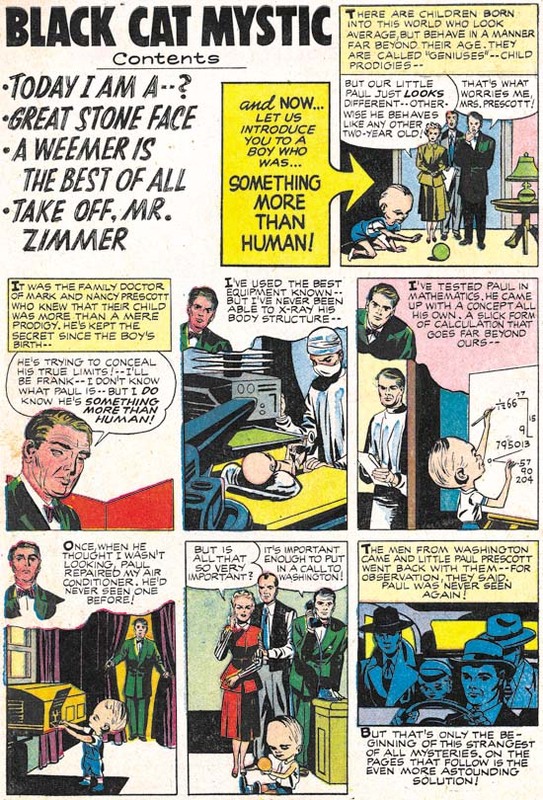 Ernest Schroeder is said to have worked for Simon and Kirby around 1954 (Who’s Who). I do not find him in my database but that just means that I have not identified his work not that he did not work for them. If he did work for Simon and Kirby he did not sign his efforts. “Get Lost” has some interesting art, particularly the way Schroeder uses lighting to provide dramatic effects. Alarming Tales #3 (January 1958) house advertisement, pencils and inks by Joe Simon? 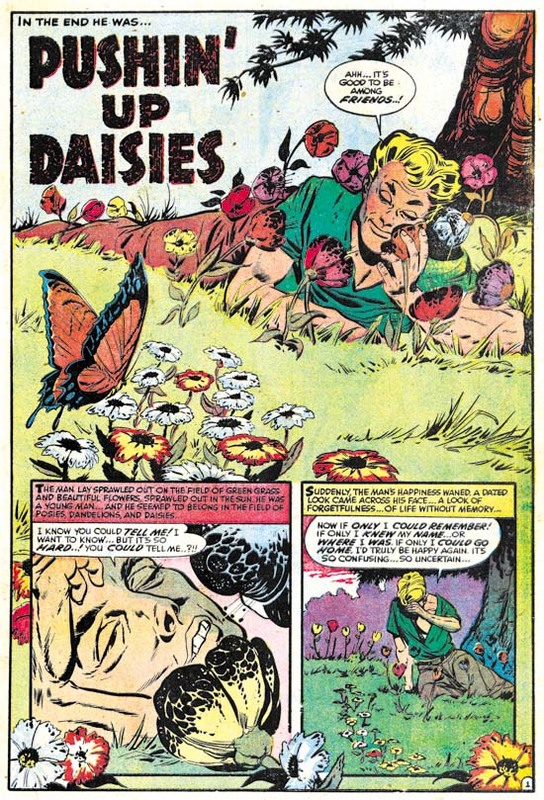 The art for this house ad was used as the contents page for Black Cat Mystic #61. Someone commented in my post of that issue that Nostrand was no longer working for Harvey at that time. IF that is true it may be that this content page/ad was done by Joe Simon swiping from an earlier Nostrand piece. I have to admit I am not a great fan of all the Harvey stories particularly those from after the Comic Code came into effect. 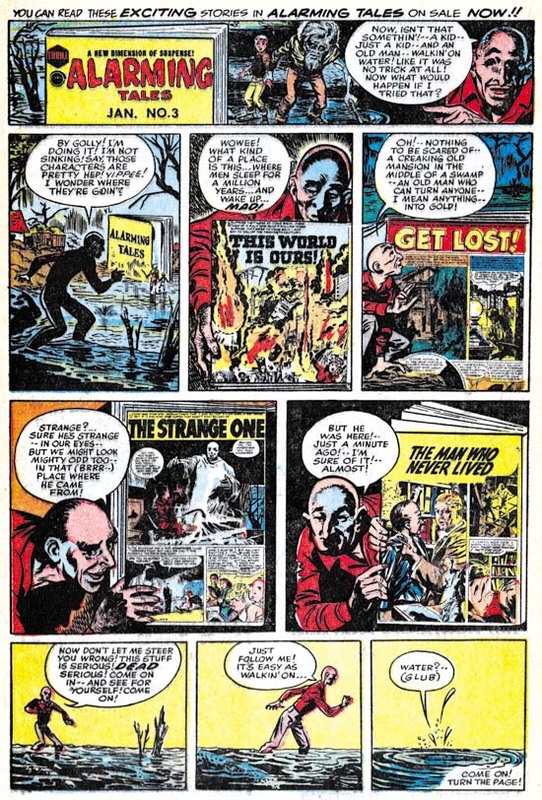 While I like the Wildey’s art work for “The Strange One” the story is a bit contrived for my tastes. It appears to me that Wildey often worked from photographs. That is not to say that all his drawings were done based on photos but that some were. “The Man Who Never Lived” seems to have a larger than normal amount of drawing from photographs. 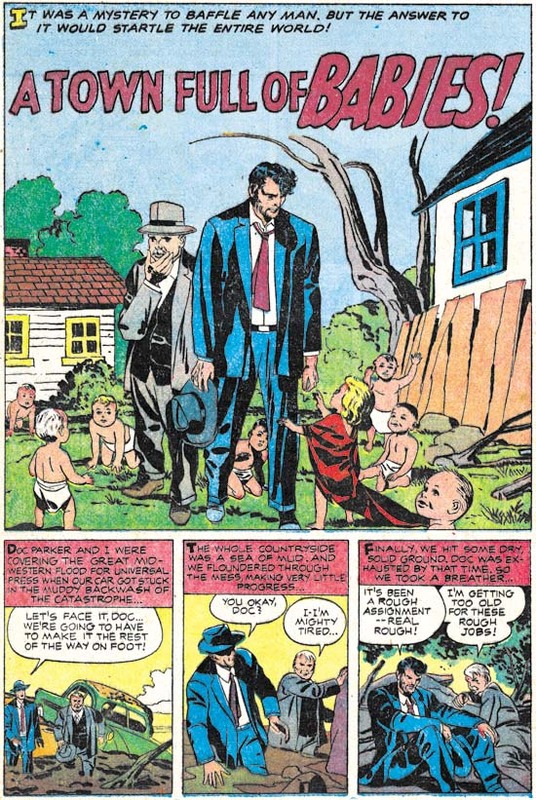 Black Cat Mystic #61 (January 1958), pencils by an unidentified artist? 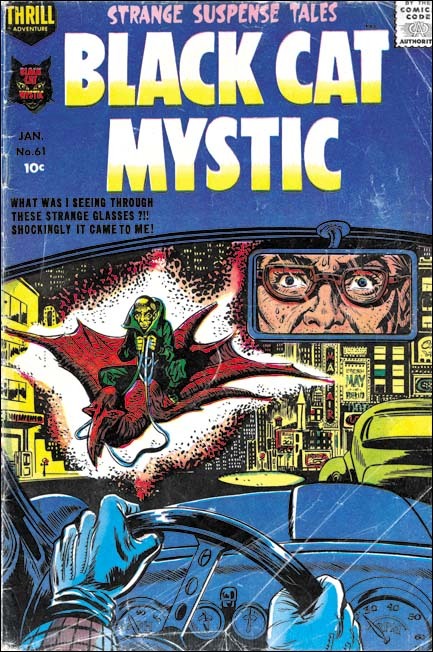 A dramatic change in the Black Cat Mystic title has come with issue #61, there is no Kirby. 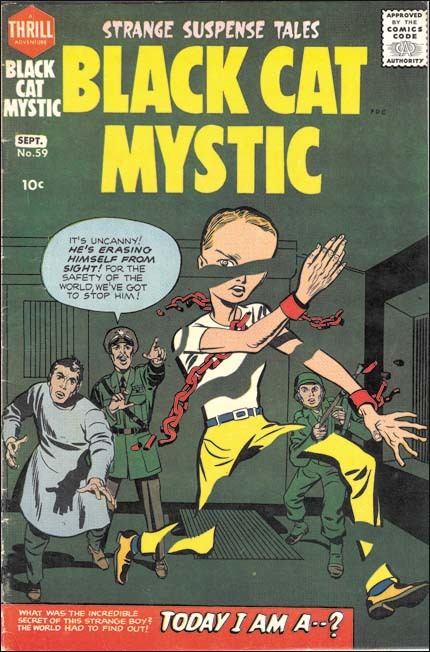 Issues 58 to 60 of Black Cat Mystic as well as Alarming Tales #1 and #2 were essentially all Kirby comics (with the exception of a two pages story drawn by Marvin Stein in AT #2). We shall see later that Kirby would continue to appear in Alarming Tales but even that would be a limited contribution in both quantity and duration. Jack had begun doing freelance work for DC which paid more than Harvey. However that does not seem like a likely explanation because he did not get as much work from DC as he would have liked. So Kirby sudden absence from Black Cat Mystic must remain a minor mystery. 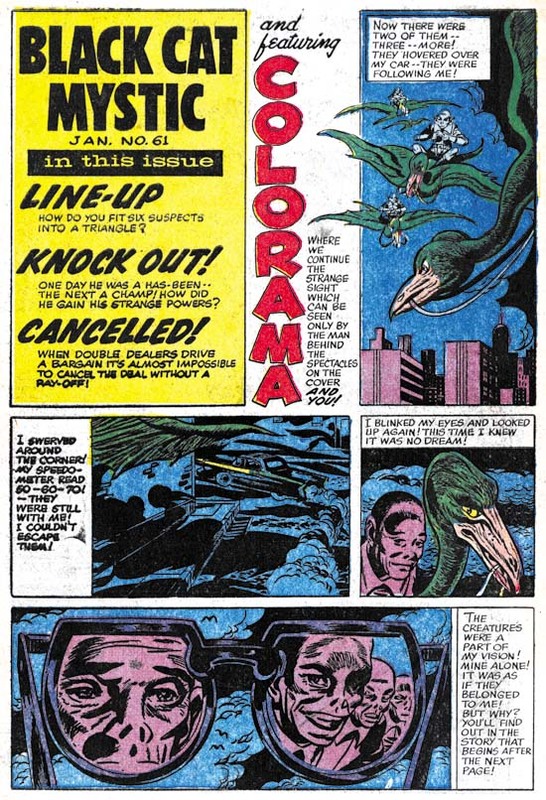 The cover is an adaptation of the splash page for “Colorama”. Bob Powell drew the interior story and but I am not completely convince he drew the cover. Joe Simon once told me that he did the cover but to be honest I cannot detect his hand in it. The flying figure and his mount do not appear in the story but oddly show up in the contents page. The flying figures is surrounded by something very much like Kirby Krackle. It is an odd but very effective cover. 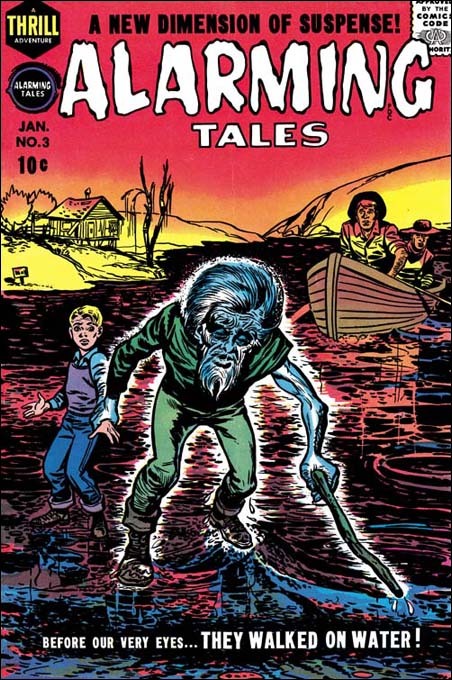 The contents page for Harvey comics were sometimes used as a sort of prequel to one of the book’s stories. It is possible that this was an innovation introduced to Harvey by Joe Simon. 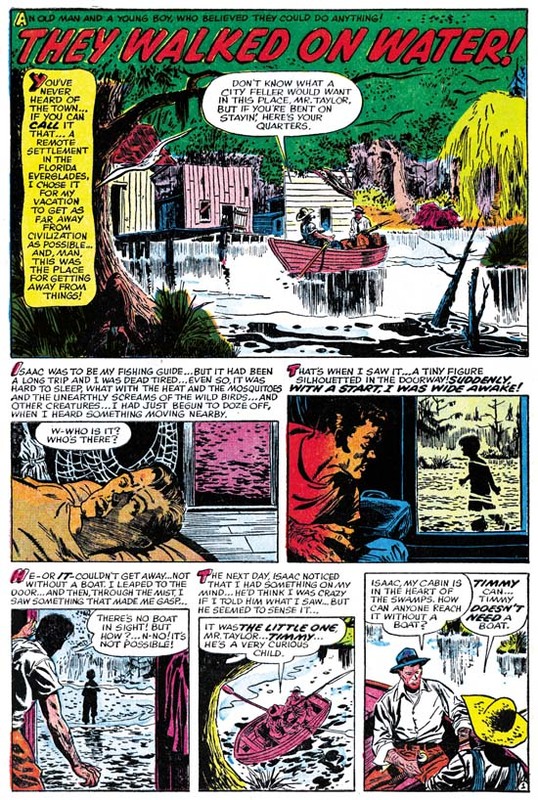 While both Kirby and Simon did some of this content pages for the Harvey romance titles, this particular one appears to have been executed by Howard Nostrand, an artist commonly used by Harvey at this time. It is here that the flying figure from the cover appears and not the actual story. Bob Powell was another regularly featured artist in Harvey titles. Powell was a great artist, at least before he was instructed at Marvel to work like Kirby. His style was particularly well suited for the horror genre and this story is a minor masterpiece. The entire story is based on what the narrator sees. It is hard to believe anyone would present a feature that seriously suggests that there were worlds to be found at the center of the earth. Such an idea may have been the inspiration for fictions writes such as Jules Verne and Edgar Rice Burroughs, but by the 50’s science had already known that the earth had a molten core incapable of supporting life. Besides doing the contents page, Nostrand was responsible for “Line-Up”. This is another odd story and like much of the book rather different than Simon and Kirby pieces. If Joe was still the book’s editor, he was using Harvey writers and artists. 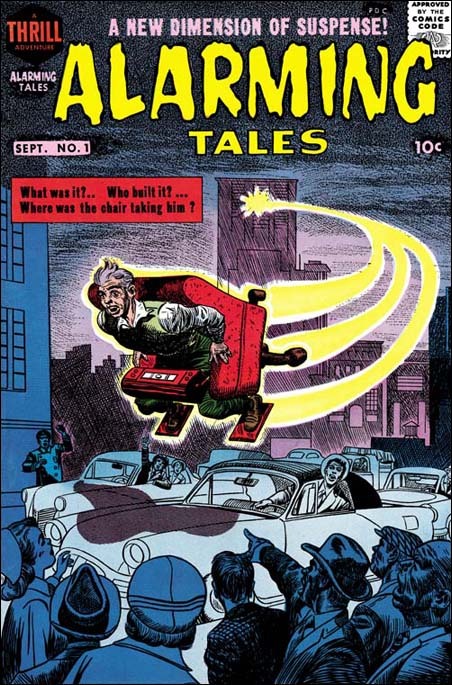 That Joe was still working for Harvey is apparent with this in house advertisement for Alarming Tales #3 (January 1958). Both the pencils and inks for this ad appear to have been done by Joe, and judging from the humor I suspect the writing as well. I remember from my days in art classes that artists often unconsciously draw people that resemble themselves. I detect something like that in the panel introducing “The Man Who Never Lived”. I have to admit that I cannot get very excited about the work by Joe Certa, but he was another one of Harvey’s regular artists. Single page works such as this one, called fillers, were often used and were generally done by lesser talents. I have only a passing knowledge of the various artists found in Harvey comics and no idea who this one was. Unfortunately Harvey seemed to have a policy prohibiting artists from signing their works (with the occasional exception of Lee Elias). I have discussed this cover on at least three prior occasions. I still feel that my last assessment of the cover art is correct, that is it was drawn by Joe Simon. The large figure looks as though it was done by Mort Meskin but this is easily explained as Joe swiped it from a story that Meskin drew. 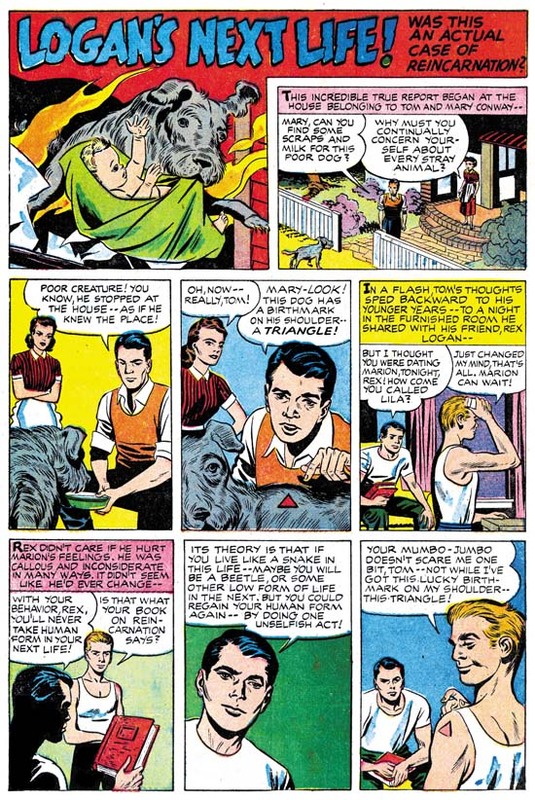 While there is a lot of Jack Kirby in this issue, it is technically not an all Kirby comic book as it includes one two page story by Marvin Stein. But the main reason that AT #2 is not as desirable a comic as Alarming Tales #1 or Black Cat Mystic #58 or #59 is the inking which is just not quite as good as those other issues. 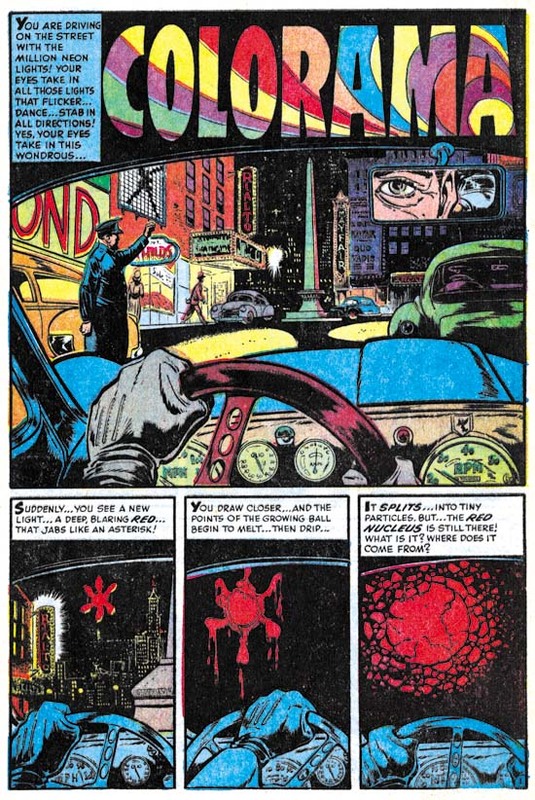 This is another story of dimensional travel (Jack Kirby’s Trips to the Fourth Dimension). Only this time there is no explanation of how the “hole in the wall” came to be. Further the other dimension turns out to be a rather nice place to live. 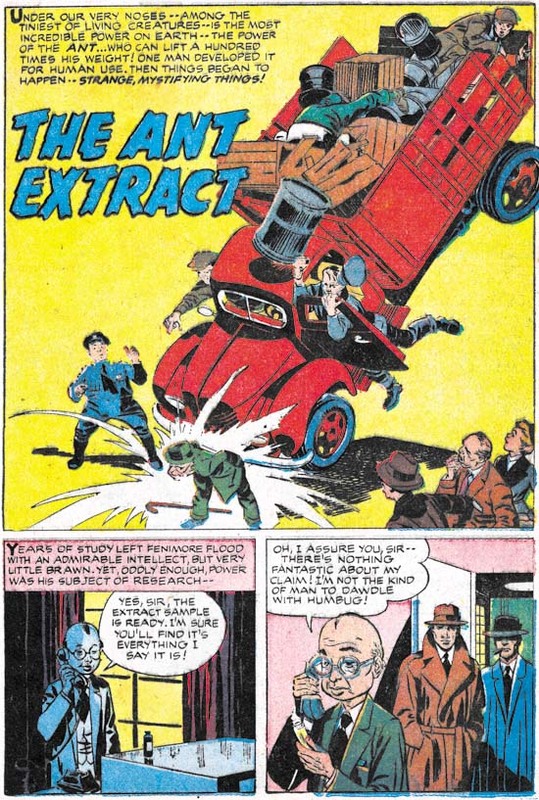 Marvin Stein entered the advertisement field sometime in 1958 (Commercial Work by Marvin Stein) so this work from AT #2 is from near the end of his comic book career. Actually that is not completely accurate because Stein continued to provides some comic book art up to June 1959. Stein’s late style was simple but done with great assurance. I am not sure how he went about creating his story art but his covers were first very roughly drawn with a blue pencil, really nothing more than quick layouts. Marvin would then add details and finish the drawing not in pencil but directly in ink. It is a procedure that very few comic book artists adopted. Stein inked his own art with a very blunt brush but this was by choice. Marvin did some inking for DC on Superboy adhering to the house style with a finer brush. 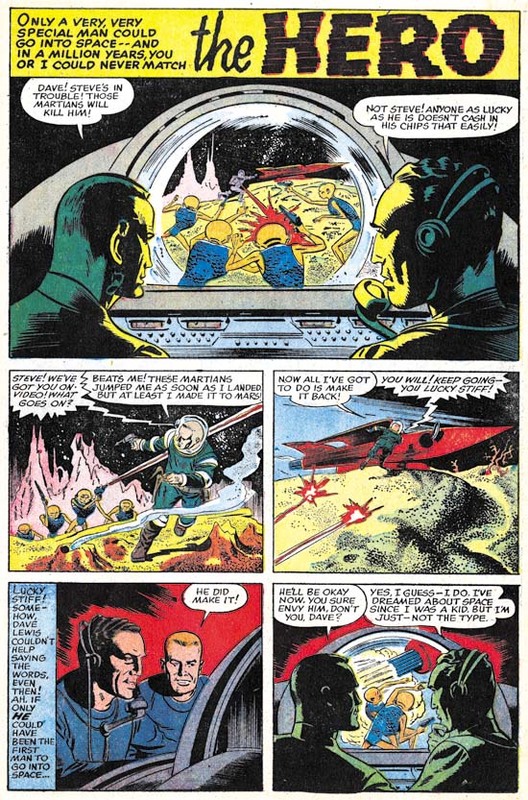 His ability to do quality inking with fine detail can be seen in the inking he did for Jack Kirby in syndication proposal called Space Busters (Bleeding Cool or What If Kirby). This very short (two pages) story is about the exciting adventurous life of a spaceman. But not everyone could be a spaceman, you had to be very special. Special in this case is of a very small stature. 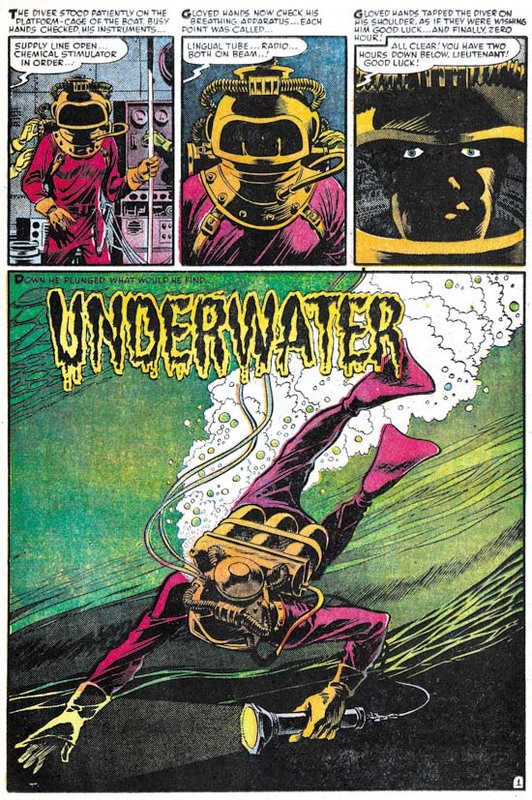 Jack Kirby would take this same theme for one of the story lines he used in Sky Masters (a syndication strip that debuted on September 8, 1958). Another story of dimensional travel, in this case to dimension five. I find it humorous that a scientist would hire a big game hunter to test his device. Or that the hunter would return without anything from the new dimension. Big game hunters was imposing figures in the culture of the time. A lone individual faced against dangerous prey exemplified bravery. But with today’s the threat of mass extinction, big game hunting seems out of place. Most people would prefer to see a wildlife documentary than some trophy hanging on a wall. 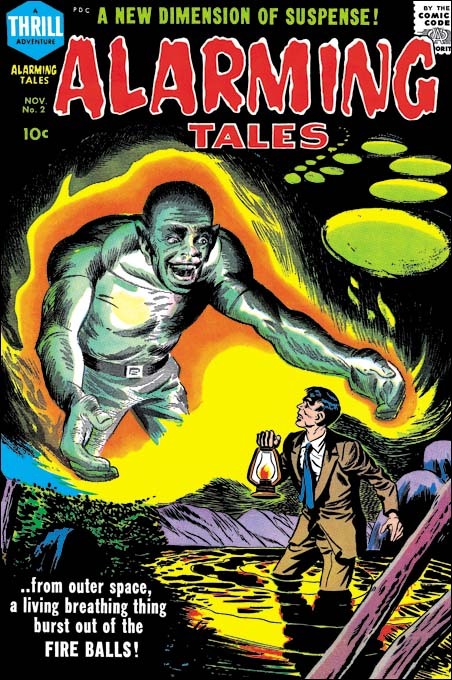 “The Fireballs” is the story featured on the cover although in the story there is no monster like figure associated with the fireballs. 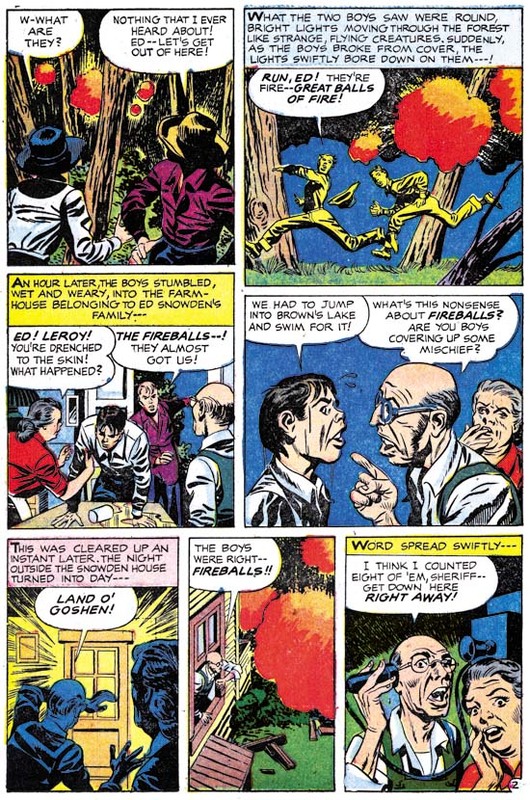 Such deviations of the cover from the story are not that unusual for Simon and Kirby, or comics books in general at that time. Previously I had considered this story as inked by Kirby as well. That was based on the inking found in certain sections. Notice the inking on the elderly man’s sleeve in panel 4 of page 2. This type of inking I refer to as picket fence inking (Inking Glossary). 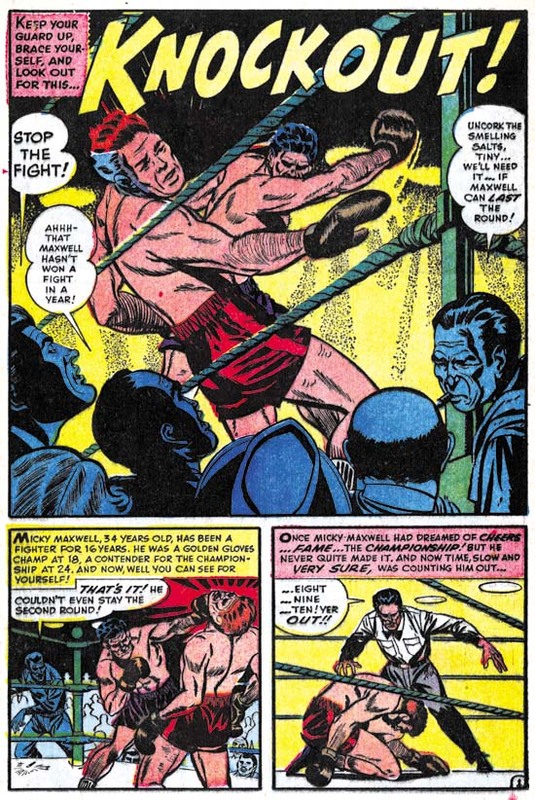 The manner that its done, drop strings with penned pickets is typical of Kirby’s inking at this time. I am still very much convinced that Kirby inked this particular piece and some other found in this story. However inking done on Kirby pencils was often done by more than one individual. At one time inking was often done like an assembly line with different inkers working on different aspects of the same pages. 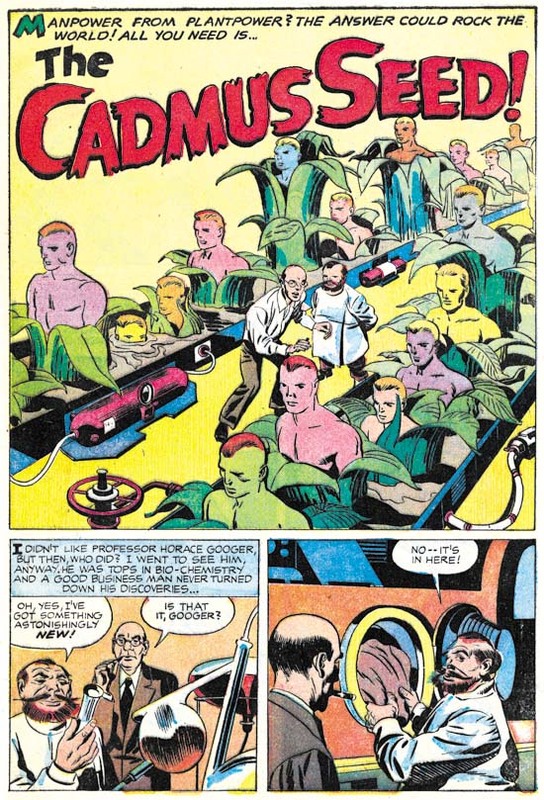 With the end of the Simon and Kirby studio such assembly line inking was no longer used but it was still very common for someone to ink Kirby’s pencils and then Jack would go over it providing touch-ups. That is what happened in the inking of “The Fireballs”. The more simplified eyebrows, use of crosshatching by pen, the rather rush looking to the work, and the common use of lighting directed up from below all remind me of the work of George Roussos to whom I now credit with the majority of the inking of this story. Robots appeared relatively frequently in Kirby stories during this period (Year of the Robots). I have no good explanation for this. Yes robots appeared in various science fiction movies but none quite like the type of robots that Kirby created. His as large and distinctly mechanical. 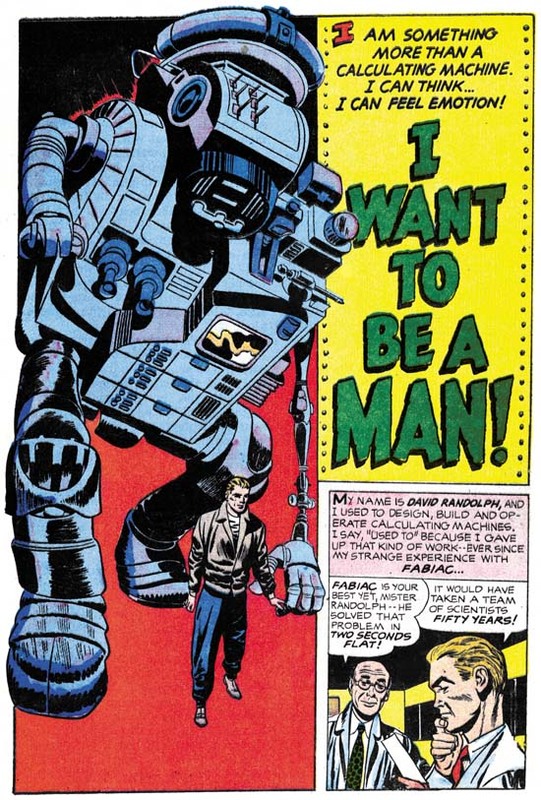 The one in “I Want to be a Man” is filled with mechanical forms. Throughout his career Kirby had a love of what I call Techno Art (Some Early Jack Kirby Techno Art). Such art would include a multitude of shapes and devices that serve no purpose other than to suggest advanced technology. Posted May 26, 2012 in 2007/05, 7 Freelance, Harvey, Harvey Horror, Kirby, Jack, Periods, Serial Posts, z Archive. 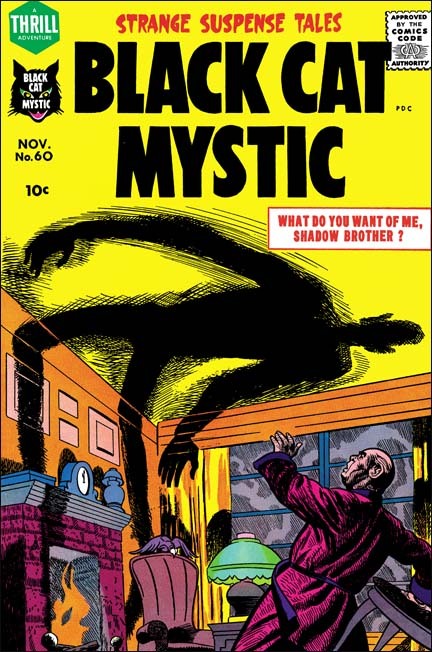 Black Cat Mystic #60 (November 1957) was another all Kirby issue. 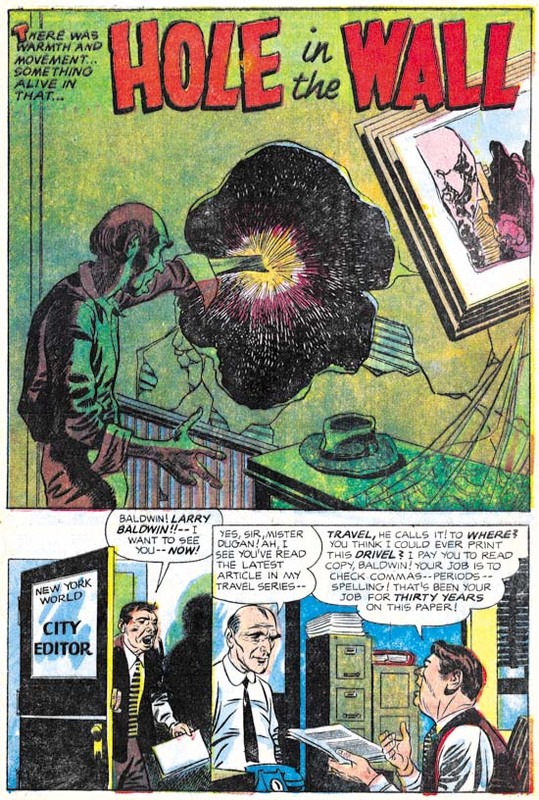 Previously that was quite unusual but with the launch of Challengers of the Unknown (Showcase #6, February 1957) all Kirby comics became more common. In my opinion BCM #60 was not quite as good as BCM #59 or Alarming Tales #1 it is still a rather nice read. Some people still attribute this cover to Jack Kirby but that position is hard to understand. Kirby was the master of comic book perspective. One look at the gentleman’s raised hand should convince anyone that this was not drawn by Kirby. It was Joe Simon that actually drew this cover. Joe was quite good at adopting styles used by other artists, particularly Kirby’s. Success requires a good appearance and exceptional talent, at least according to “A Snap Of The Fingers”. Two down and out individuals lack one or the other quality so they join forces. Of course this tale belongs to the horror genre so this story does not end with happy ever after. I have to say that I suspect that the story has been modified to get past the Comic Code. In the story an accident occurs that I believe originally was planned murder. The change would not affect the art work only some of the text. At one time I thought this piece had been drawn by Joe Simon but I later realized it was Simon’s inking that gave the appearance that he had penciled it as well. This is a short piece (two pages) that is about a supposedly true prophecy of the discoverer of the new world. I wonder what Simon and Kirby’s source was for this tale. I had thought it might have been “Stranger Than Science” by Frank Edwards. I remember reading Edwards’ book when I was young and it was full of such stories. However “Stranger Than Science” was first published in 1959 and so is too late to be the source. This story was inked by Kirby himself except for the last page. I am not sure who did that page but it was not Joe Simon. The theme of getting a chance to relive one’s life was used once before by Simon and Kirby. I have to say that somehow this would seem more like a death sentence unless somehow they retained their original memories. But even that might not be such a great gift. Would anyone really want to relive their childhood while retaining the memories of an adult? A diminutive scientist creates a solution that endows the drinker with amazing strength. What is particularly surprising about this discovery is that the scientists announces it before he has even tested it. 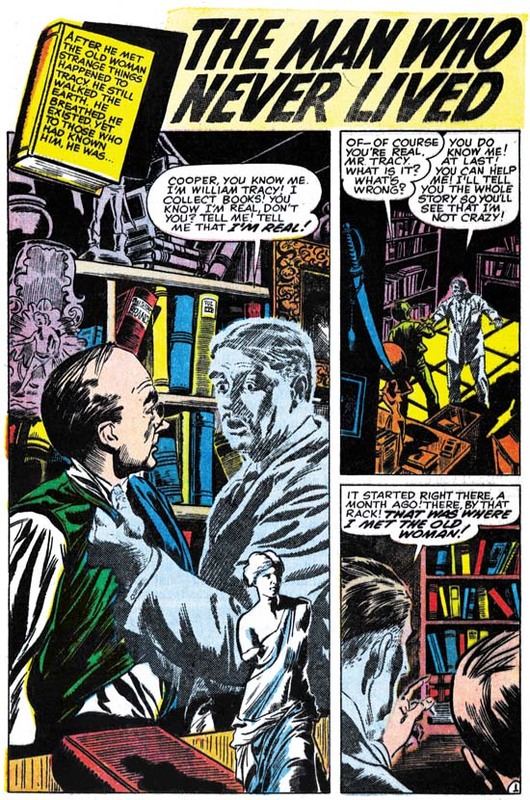 Simon and Kirby had a rather peculiar idea about what a scientist was and how he would go about his work. But while it was not an accurate portrayal it did make for an interesting story. What would society do with his new scientific breakthrough? It is a humorous story but I will not reveal anything more. You will just have to wait for Titan to release the next volume from the Simon and Kirby Library. Another story featuring scientists, in this case a professor type and a boy genius. The story contains some rather bizarre physics but hey, its just a comic. Unfortunately “Shadow Brother” is marred by rather poor printing. Harvey’s comics from the late 50’s had particularly bad printing that affects some stories more than others. Comic books sometimes provide glimpses into the past. 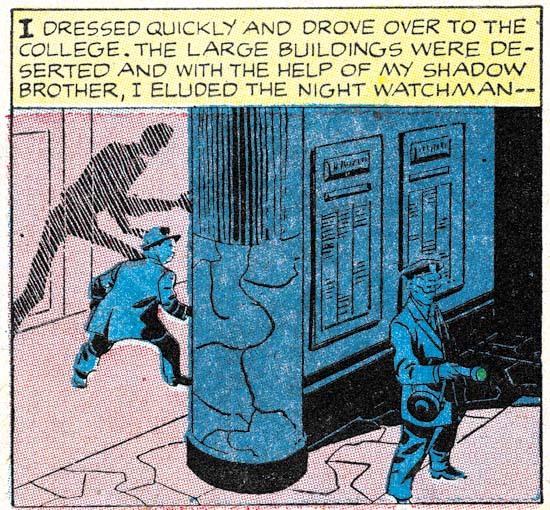 Panel 4 from page 3 shows a night watchman at a college. But why does the night watchman carry a purse? Well it is not a purse but a guard tour clock. Night watchmen were expected to petrol premises throughout the night when no one was expected to be around. But since no one was around how could an employer be sure the guard was actually conducting patrols and not sleeping on some couch? This clocking device was the solution to this problem. Special keys would be chained to the wall at various locations usually stored in a small container also mounted the wall. When the night watchman made his rounds he would insert these keys into his guard tour clock which would report what key was used and the time of its use. A record was therefore made that the employer could then examine later to verify that the watchman was performing his duty. Video cameras are so prevalent today that I would have thought that guard tour clocks would have become obsolete but a quick Google shows they are still being sold. Nine months separated Black Cat Mystery #57 and Black Cat Mystic #58. Such a lengthy delay would make it difficult for the title to pick up a following of readers. That was bad enough but it would be a further year before Black Cat Mystic #59 hit the stands. What was Harvey thinking? The inking style used by Jack Kirby for BCM #59 does not match very well with his inking found in other publications from 1957 but it is a good match for the inking he did in BCM #58 (Jack Kirby’s Austere Inking, Chapter 8, More Harvey). 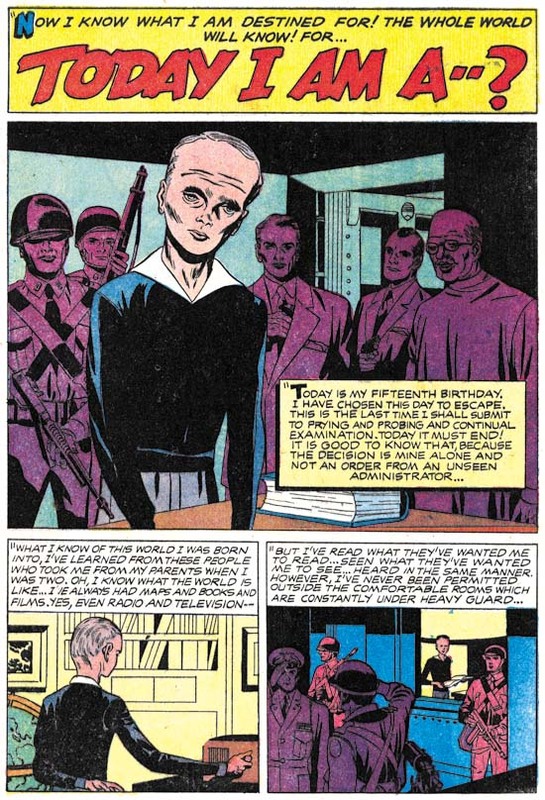 The original art for one of the stories (“The Great Stone Face”) has a Comic Code approval stamp dated June 1956 which shows that the art was in fact created in 1956. Normally getting the Comic Code approval was the last step before getting ready for the printers which would suggest a planned publication date of October or November 1956. That is just the date that would be expected had Harvey not put the issue on hold. Again what was Harvey thinking? This is not a suggestion that Harvey made a poor decision (although that was true) but a real question on why the apparently sudden change in plans. Poor sales does not seem a likely explanation. Sales figures for BCM #58 would not have been available at the time the decision was made to hold back on BCM #59. The cover for BCM #59 shows a figure erasing himself away, a rather unusual image to say the least. The figure has six fingers per hand and a large head which indicate he is not truly human. That the figure was also chained indicates that he was considered a threat by the scientist and soldiers shown on the cover. 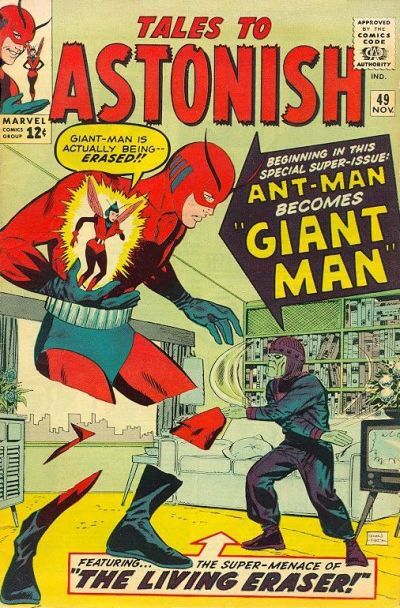 While by no means identical a similar cover was created years later for Tales to Astonish #49 (November 1963). The cover artist was Don Heck but the story was drawn by Kirby and inked by Heck. Apparently the Living Eraser was for years used as an example of occasional failures by Lee and Kirby collaboration. 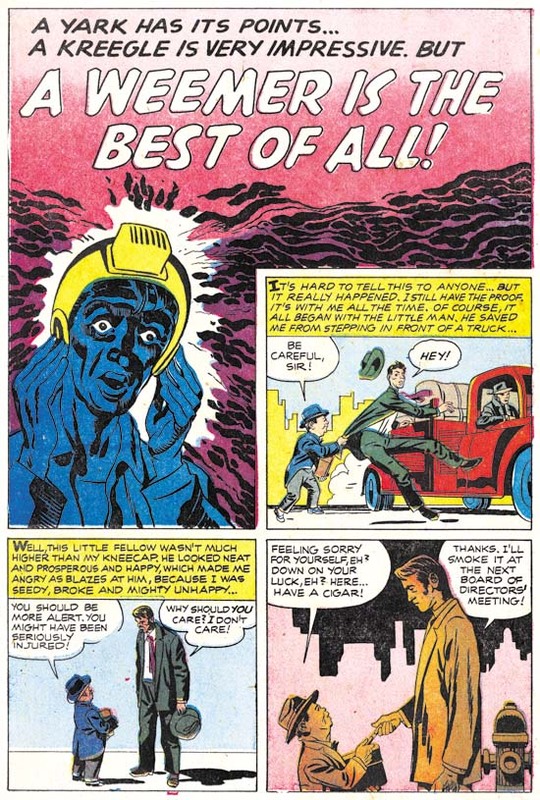 While the Living Eraser was not up to the standards of comic book antagonists like Galactus he seems better than some of the other early creations such as Paste Pot Pete. At least the Living Eraser provided a memorable image. A contents page was pretty much standard at Harvey when Simon began working there as an editor. But it appears to have been Joe that converted the page into an introduction page. This introduction would be a sort of a prequel to one of the stories in the comic. 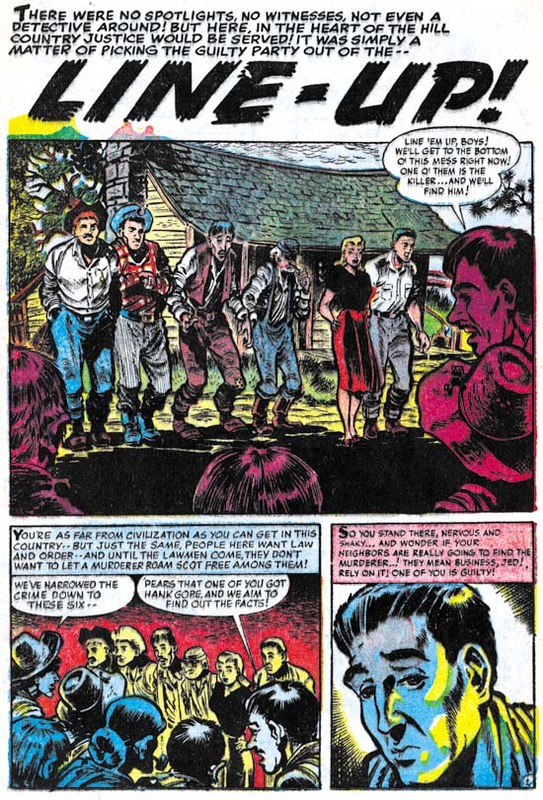 Joe would often try to draw the introduction in the same style as the artist who did the story (Joe Simon’s Turn At Imitating). Joe was good enough of a mimic that some experts still attribute these introduction to the story artist. 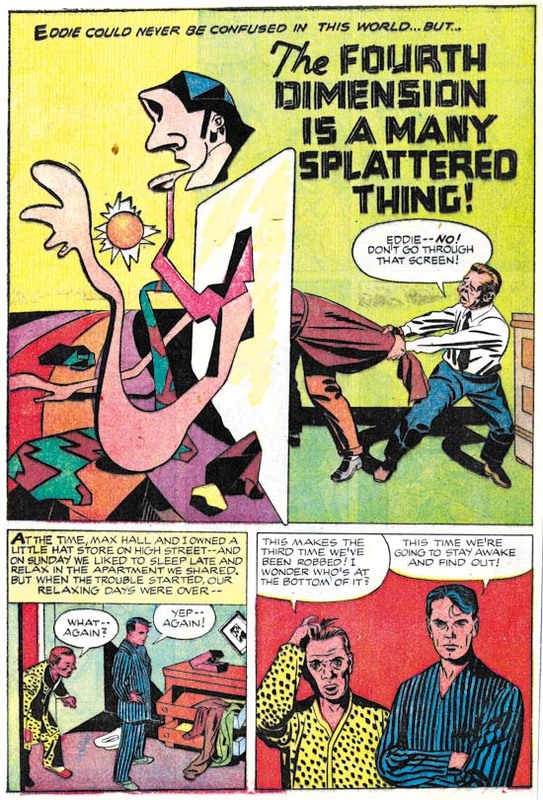 Jack Kirby also did some introductions for Harvey (Bill Draut and His Imitator, Jack Kirby, Jack Kirby Swiping from Bill Draut, Kirby Imitating John Prentice and Kirby Imitating John Prentice Again). Previously I believed that Jack was imitating the story artist as well. However Kirby was a rather poor imitator and except for one swipe Jack was just being himself. I now realize it was Simon who was purposely inking of these pieces to made them look the story artist. But in the case of the Introduction for BCM #59 Kirby was the story artist and Joe inks the piece in his normal manner. Jack Kirby is famous for his high action comic art. Understandably because he was so good at it. But Kirby was also master at building tension into a story and “Today I Am A…” is a great example of that. In the hands of a lesser artist this might have been a rather mundane story but Jack transforms it with his usual magic. “Today I am a man” is a bar mitzvah cliché that was probably lost to most of the young readers when this story first was published but it is a clever title for a story of an exceptional individual becoming of age. The Introduction and story “Today I Am A…” never mention the word mutant. However despite his physical and mental differences the main character Paul was born of normal parents. He was clearly meant to be a sudden and dramatic stage in the evolution of mankind. Normal humans fear and seek to confine him. 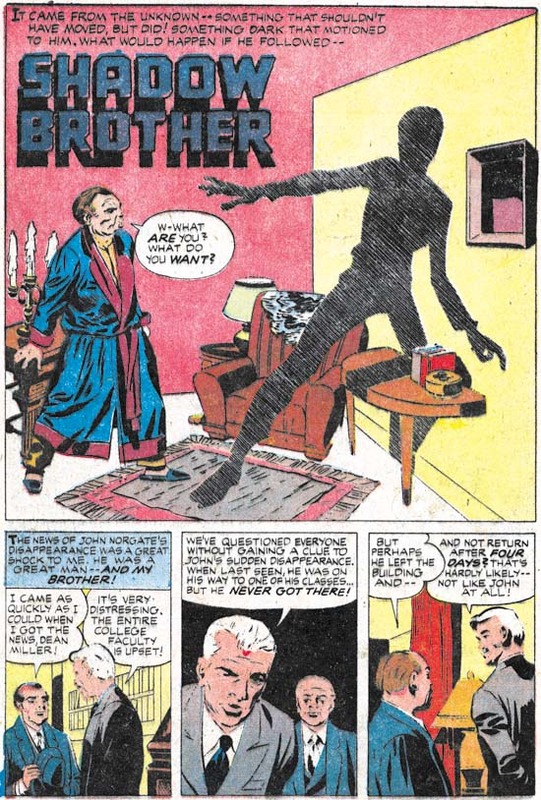 I do not think I am out of line to suggest that in this story from BCM #59 we find the concepts that would eventually become Homo superior feared by the rest of humanity that would be the basis for the X-Men created by Stan Lee and Jack Kirby. 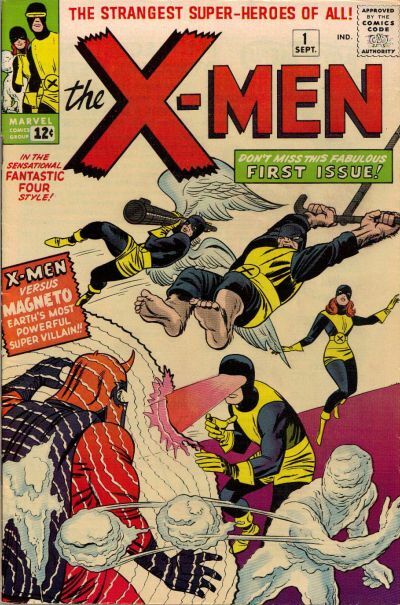 Some fans object to provided creation credits to Lee and Kirby because of all the individual X-Men that were created by other artists. However it was Lee and Kirby that created the premise of mutants and public mistrust that is the foundation of this series right up to today. “A Weemer Is the Best of All” is a story in a more humorous vein. Not side-splitting humor but definitely a story not meant to be taken seriously. 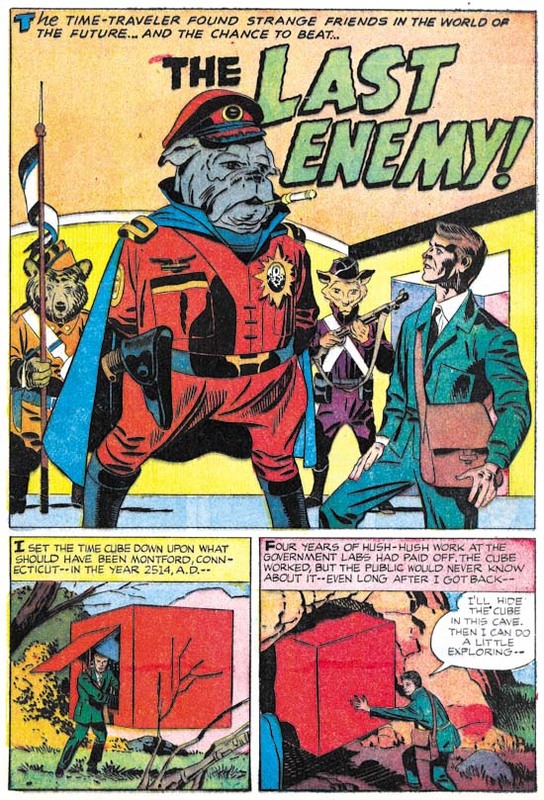 Humor was frequently a part of Simon and Kirby’s repertoire. Even action stories often had humorous parts to them. A monumental stone sculpture of unknown origin, an African tribe with technical skills, and a rifle slinging anthropologist. This is one of those stories so imaginative that one wonders where they came up with it. I can understand the anthropologist but where did the rest come from? Both Joe and Jack were science fiction fans and I suspect somewhere in the pulp magazines they read supplied the kernels that eventually formed into stories such as this one. 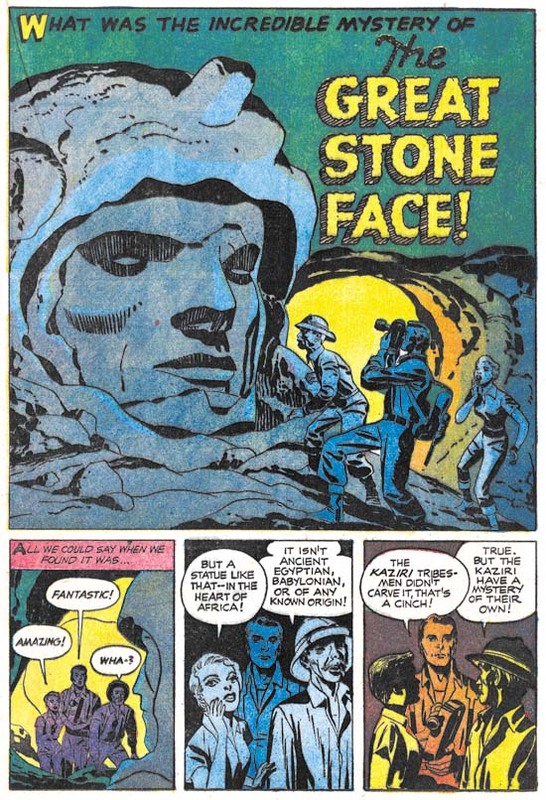 The theme of gigantic aliens residing on earth for immense periods of time for mysterious reasons is common to both “The Great Stone Face” and the Eternals (a title Kirby created for Marvel in 1976). Jack would often expand on story lines he worked on earlier in his career. 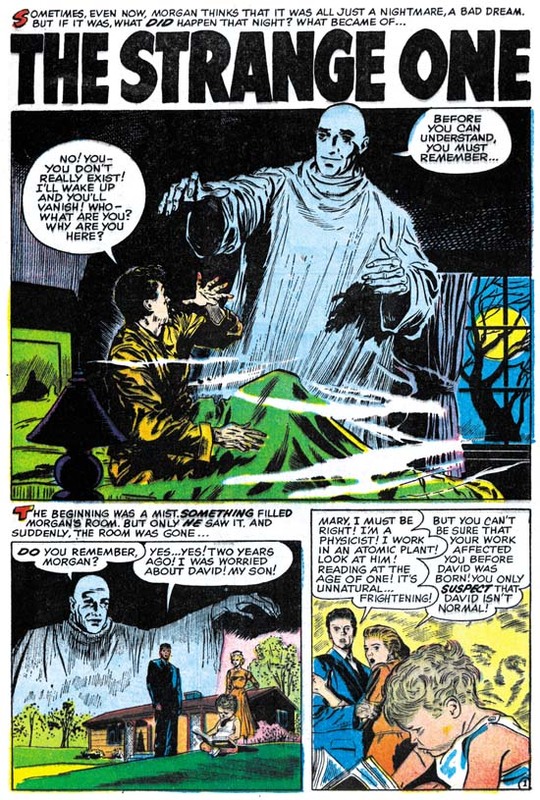 The ghost Mr. Zimmer was presented in BCM #58 and seems to have been planned as a recurring character. In BCM #58 Mr. Zimmer was presented in the first, featured, story. However in BCM #59 Mr. Zimmer became delegated to the final story in the book. While the title Black Cat Mystic would suggest the horror genre the contents were predominately science fiction. So perhaps Mr. Zimmer fall from grace was just a recognition that he was somewhat out of place in the direction the title had gone. But then again horror, although a rather mild version suitable for the Comic Code, would continue to play a roll in the title. In any case this would the last appearance of Mr. Zimmer. Posted April 14, 2012 in 2012/04, 7 Freelance, Artists, Harvey, Harvey Horror, Kirby, Jack, Meskin, Mort, Periods, Serial Posts, z Archive. 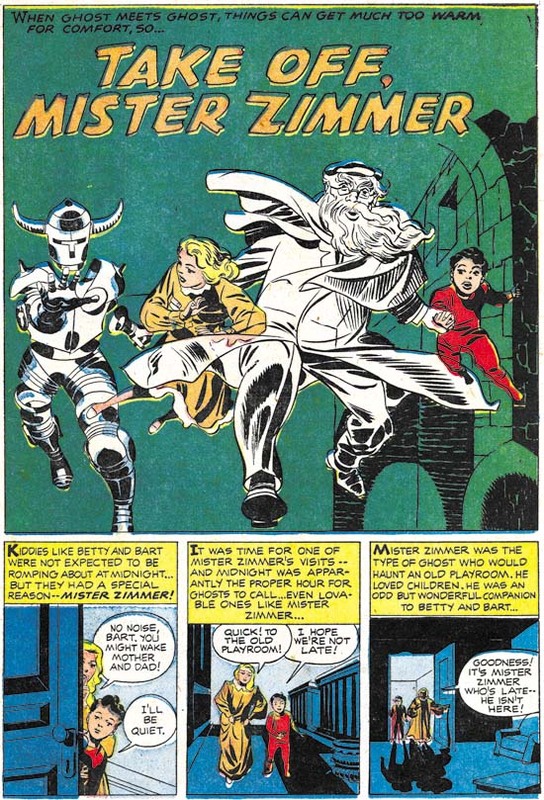 The break up of the Simon and Kirby studio, was not the end of Simon and Kirby collaborations. Even after Kirby began freelancing, Simon would still turn to Jack to help with comic book titles that he would work on. 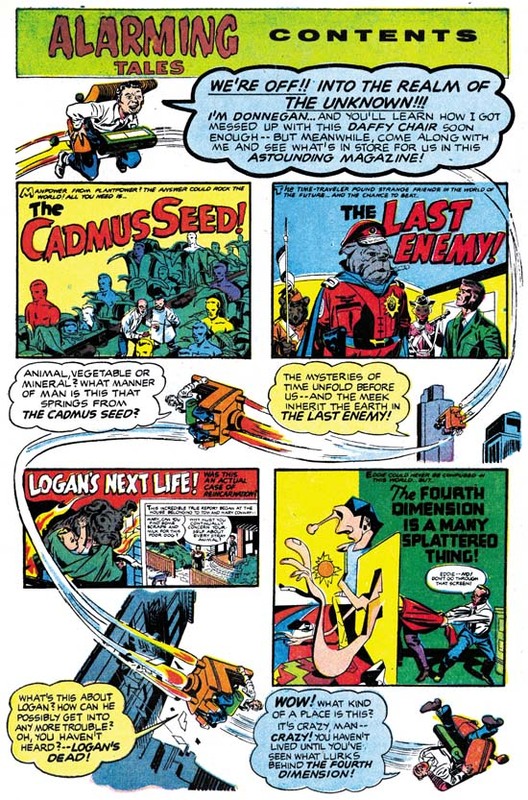 While Kirby contributed to these projects, particularly for the initial issues of a title, these were essentially Simon’s projects. Nonetheless I am sure that Jack had much creative freedom on the pieces he actually drew. I will begin examining, in some cases re-examining, these late collaborations beginning with Black Cat Mystery #57 (January 1956). 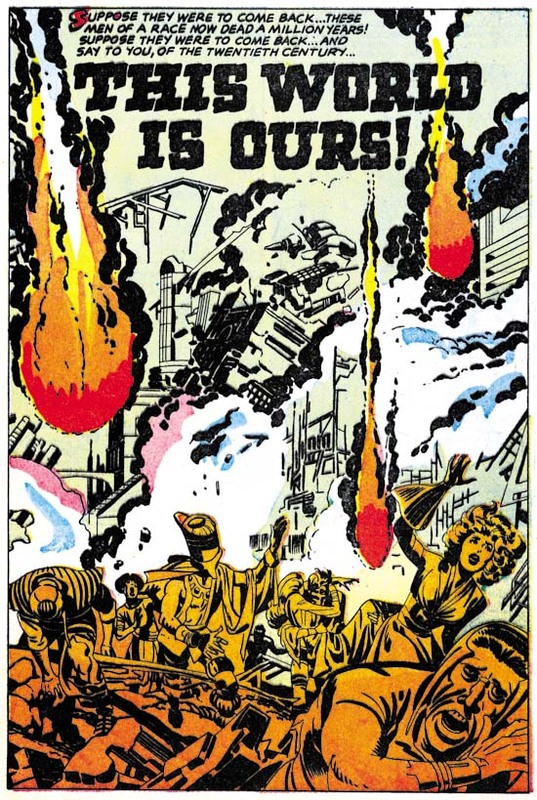 There is some question as to exactly when the Simon and Kirby studio disbanded. In my opinion the latest date that can be assigned to the breakup would be August 1955 (cover date) when the final issues of the former Mainline titles were published by Charlton (Foxhole #6 and Police Trap #6). However is possible that some of the art to be discussed in this serial post could have been created before the studio breakup. The Black Cat series had undergone a number of title changes. 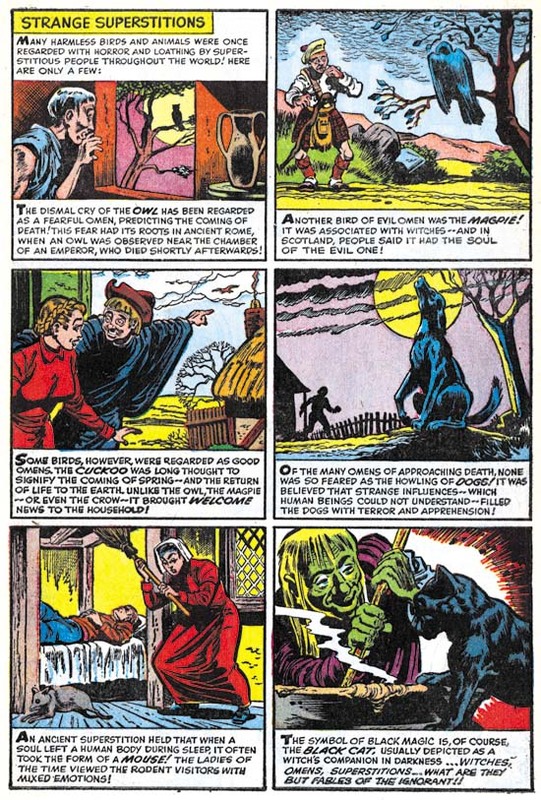 Starting out as Black Cat based on a female superhero (#1, June 1946), then becoming Black Cat Western while presumably retaining the female hero (#16, March 1949), returning to Black Cat (#20, November 1949), switching to Black Cat Mystery and a horror genre (#30, August 1951), returning once again to Black Cat but retaining the horror content (#44, June 1953) before returning again to Black Cat Western without the horror and with the titled superhero (#54, February 1954). The last switch from horror content may have been prompted by all the adverse public criticism of genre which lead to the establishment of the Comic Code Authority. Black Cat Western #54 (February 1954) and #56 (October 1956) contain much reprint material from earlier issues according to the GCD. Black Cat Mystery #57 brought a returned to the old title and the horror genre although the horror was the mild form suitable for passing the strict Comic Code. Jack Kirby only contribution to the issue #57 was the art for the cover. 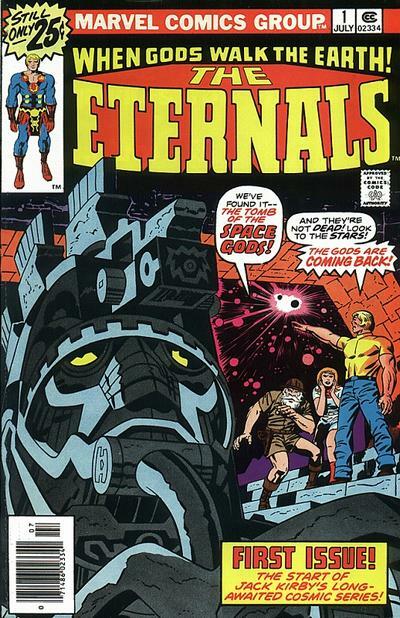 With Simon and Kirby there is always the possibility that a particular cover art could have been recycled from an earlier unused cover. However in the case of the cover for BCM #57, there are two reasons to believe that did not happen. The somewhat humorous aspect to the cover would have been out of place for Black Magic the only appropriate alternate source for this type of cover. Further the cover is based on a story found inside (see below). 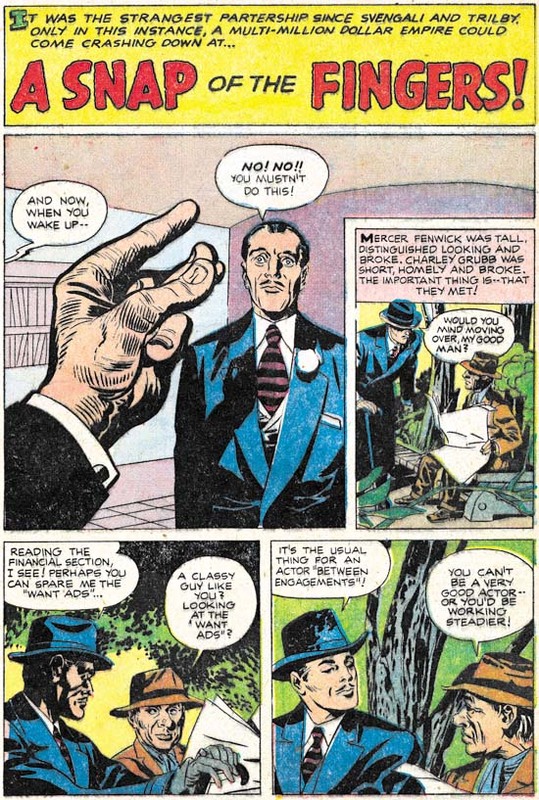 It is doubtful that the inside story was recycled because Black Magic was a pre-Code comic and therefore any story from it would have had difficulty getting Comic Code approval. I suspect that Kirby had not actually seen the interior story since that story had nothing to do with an underwater fish civilization. The original art for this cover still exists and it would be interesting to see the date of the Comic Code Approval. While this cover was probably made for this issue it is still possible that the entire issue was put together some time previously. 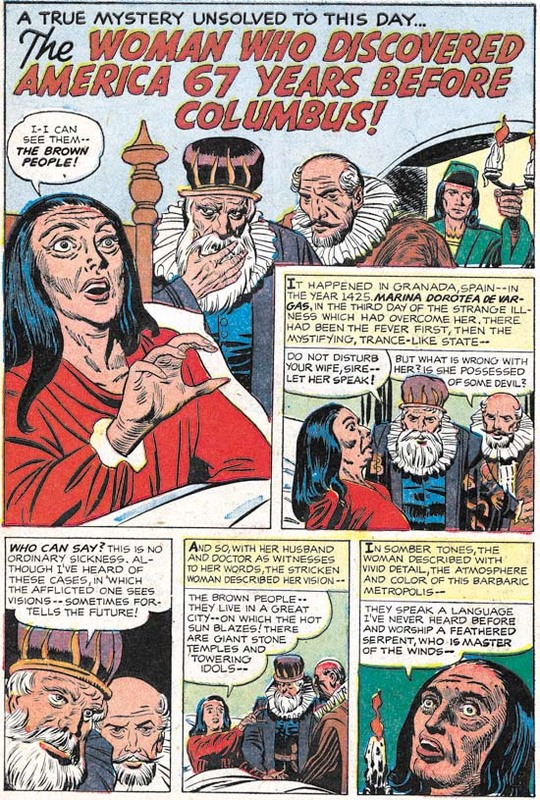 Although Bob Powell had occasionally done work for Simon and Kirby, he was largely a Harvey artist having provided much work to that company over many years. Earlier Harvey horror stories were too extreme to pass the Comic Code without modifications but there are no signs of changes so this was almost certainly a new piece created for this title. Black Cat Mystery #57 (January 1956) “20th Century Man”, pencils by John Giunta, inks by Manny Stallman? John Giunta only did a few pieces of work for Simon and Kirby (see Art of Romance Chapter 9 and It’s A Crime Chapter 7). Giunta seems to have worked for a variety of publishers including a few pieces for Harvey. His style is a little dry for my tastes particularly for the crime or romance genre. However his style works very well for this particular story. I especially like the splash. The background with is jumbled silhouettes and scratchy and splashy inking is very effective. It is a little surprising to see such rough work for this artist but otherwise the inking looks like that found in some of his other work inked by Manny Stallman so I believe Stallman may have been the inker here as well. 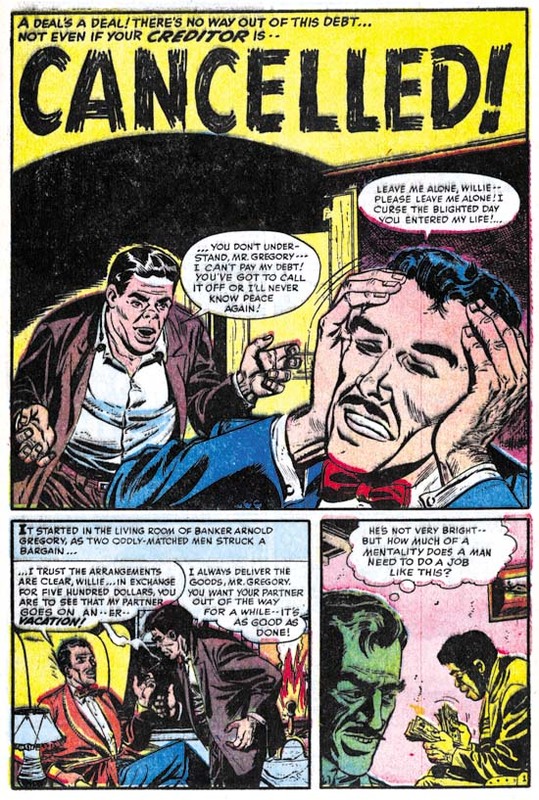 Howard Nostrand is another artist that normally I cannot get too enthusiastic about. But the opening sequence for “Underwater” is just superb. Nostrand was a frequent contributor to Harvey Comics but as far as I know never previously worked for Simon and Kirby. 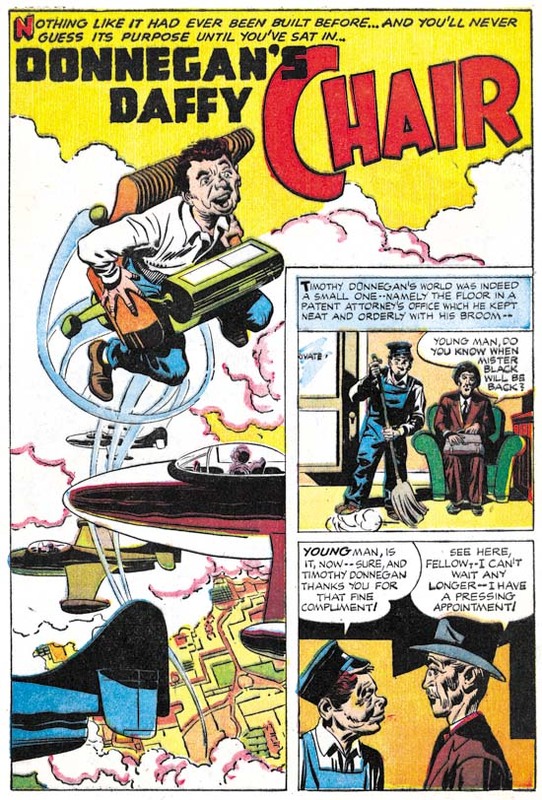 The final story, “The World of Mr. Chatt”, was drawn by a former Simon and Kirby regular (or what I sometimes refer to as one of the usual suspects) however Mort did very little work for Harvey. The only other Harvey piece that I am aware of was “Credit and Loss” from Chamber of Chills #24 (July 1954, a real masterpiece) but I have heard he did another earlier piece for Black Cat as well. Meskin was doing a lot of work for DC at this time. Many have criticized Mort’s DC work but in many ways he was still doing great art. But the emphasis of this late work was the almost cinematic approach that Meskin used to graphically tell a story. Mort’s careful control of pacing and view points was just masterful but unfortunately involved subtleties that many readers failed to notice or appreciate. 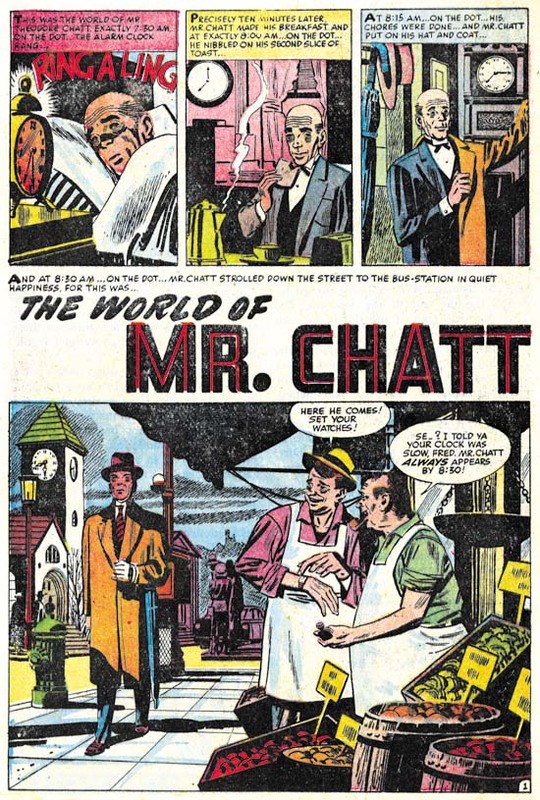 “The World of Mr. Chatt” is a good example of Meskin’s late approach. Note the simple but effective opening sequence to the story. My main criticism of this particular work of art concerns the inking. I have not done a careful study but I suspect that Mort did not ink a lot of this later work and I am pretty certain he did not ink this piece. Again without careful inspection the inking reminds me of George Roussos. I believe that Joe Simon was responsible for putting Black Cat Mystery #57 together although I have little evidence to back that up other than the cover that Jack Kirby provided. With the exception of Meskin, the artists used in this issue mostly seem to be drawn from Harvey’s talent pool. This is not too surprising as it suggests that the title had to be put together quickly. We shall see later that something similar happened with the first issue of Race for the Moon. The next issue would more clearly show the Simon and Kirby touch.